19 ¶And he took bread, and gave thanks, and brake it, and gave unto them, saying, This is my body which is given for you: this do in remembrance of me. 23 And the governor said, Why, what evil hath he done? 24 ¶When Pilate saw that he could prevail nothing, but that rather a tumult was made, he took water, and washed his hands before the multitude, saying, I am innocent of the blood of this just person: see ye to it. This was done by Jesus. The fight was won by Jesus. King of Kings, and Lord of Lords. And He shall reign forever and ever. Hallelujah! Can kids comprehend the cross? Except for a few details such as being “with child from the Holy Spirit,” children don’t seem to have much problem understanding the Christmas story. God came to earth as a baby. His mother was Mary; his earthy father, Joseph. They had traveled a long way and were sleeping in a barn the night He was born. The good guys, like the shepherds and the wise men, celebrated His birth, but others did not. Compare that story with the 33-year-old Jesus voluntarily traveling to Jerusalem, celebrating Passover, staying silent before His accusers, being flogged, beaten, spat upon, having a crown of thorns forced onto His head, carrying the instrument of His homicide, nailed to a rough, wooden cross, and suffering for six hours until He died. Easter is difficult to explain and understand for adults, but much more so for children. It is here that traditions can help families explain the tragedy and hope of Easter. Using tactile items to tell the story of Easter helps children understand the events on a level appropriate for their sensitivity and maturity. It also leaves room for their understanding to grow through the years. On top of that, new traditions help families mark, remember, and celebrate the most important of holy days in Christendom. The ubiquitous plastic eggs have become synonymous with the Easter season. This has led some families to create a new tradition that embraces them but also points away from the commercialization of Easter and toward the reason we celebrate. Parents get children to help them create or find items that go inside the eggs to symbolize the events of Easter. Most limit the items to 12 so the eggs can be kept in a common egg carton. Families choose different symbols including: a cracker to symbolize the Last Supper (Matthew 26:26), silver coins (Matthew 26:14-16), a piece of leather or rope (John 19:1), a twig of thorns (Matthew 27:29), a cross (19:16-17), a large nail (John 19:18), a sign reading “King of the Jews” (Luke 23:38), a sponge (Matthew 27:48), a spear (John 19:34), cloves or spices (Luke 24:1), a rock (Matthew 27:59-60), and a white piece of linen (John 20:7). The last egg is left empty to show that Jesus left the tomb on the third day. No matter what items are chosen, it is important to include a Scripture reference inside each egg. This will also help children see Scripture as living, breathing, and applicable rather than dry and boring. On the first day, parents read Genesis 1-2 and children place an ornament that resembles earth on the tree. That ornament can be papier-mâché or a colored balloon. On day seven, families can read Genesis 37, 40-46 (or excerpts from those chapters) and place an ornament symbolizing Joseph’s coat of many colors. On day eight, a lamb is placed on a branch while reading Exodus 12, the story of the Passover. This is a perfect time to discuss how the Passover is a foreshadowing of Easter. Families continue working their way through God’s story of redemption to its culmination in the resurrection. But the Resurrection Tree doesn’t have to take 30 days. Some families make one ornament for every week of Lent. (See sidebar.) Others choose to make only four ornaments the first year, carefully explaining each symbol. They add a few more the next year and further explain the ramifications of Easter to their children. Messianic Jewish congregations possess a great way of teaching that the gospel did not begin in the New Testament but was in God’s plan from the very beginning. They celebrate Passover with a Seder meal, and some choose to end the dinner with Communion. The Seder meal consists of many elements including the washing of hands, a time during which children ask four questions and are answered by the leader of the Seder meal, the hiding and finding of the Afkomen (unleavened bread), the four cups of wine that involve a reading and response filled with history and Scripture, the partaking of the Seder plate consisting of Karpas (greens), Beltzah (a boiled egg), Maror (a bitter herb), Charoset (a sweet mixture of chopped apples, nuts, honey, and cinnamon), and the shank bone of a lamb. Every aspect of the Seder meal has a powerful, symbolic meaning. That meaning is amplified when viewed through the lens of Jesus’ death, burial, and resurrection. The Seder meal is a tradition thousands of years in the making and will bring extra meaning to your family’s Easter celebration. Easter is certainly difficult to explain and hard to understand, especially for children. However, it can also be the most celebratory, meaningful, and maturing seasons in a Christian child’s life. These traditions, and many others like them, will ensure that your children remember that Easter isn’t about new clothes, candy, and an oversized bunny. It is about the Creator of the Universe clothing Himself in flesh and offering Himself as a sacrifice for our sins. Whatever traditions you choose to establish, make sure they will be remembered, treasured, and repeated. Lent – This year, Lent began on February 18, Ash Wednesday. Although the Lenten season is almost complete, it isn’t too late to prepare your family for Easter through this traditional time marked by self-examination, prayer, fasting, self-denial, and repentance. Here are some ideas for Lent to help you get started. Practice self-denial. Give up something important to you. A few examples include withholding food for one meal a day, giving up coffee or tea, abstaining from television, or choosing to read only Scripture. Serve those around you. Make a special effort to follow Jesus’s life of service by finding families in your community to bless, or by making a sacrificial gift to a gospel ministry. Make pretzels. Pretzels are a traditional Lenten food symbolizing arms crossed in prayer. Making pretzels is a memorable way to include children in the Lenten season. Prepare your heart. Like an annual physical exam, use this time to access your relationship with Christ. Pray through the verses of Psalm 51 and meditate on it daily. Begin a focused family Bible time. If your family is not in the habit of studying Scripture together, Lent is a great time to begin. The Easter story found in Mark 14-16 is an appropriate passage. Easter is the Sunday that celebrates the resurrection of Christ, and is one of the most holy days in the calendar of Christian churches. 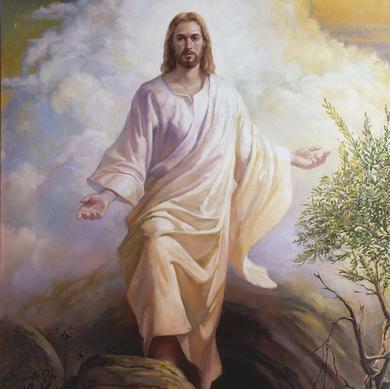 The Easter message is one of hope and victory over death, for it recalls that Christ rose from the dead on the third day after his crucifixion. Easter symbolizes the love of God and the promise that man’s soul is immortal. Passiflora, a passion flower [Lat. flos passionis], is an amazing example of beauty of nature created through Divine Intervention. The flower was first discovered in the New World in the 17th century and was presented to the Old World by Jesuit missionary priests. Its unique anatomy, not found on any other flower, symbolically represents the events our Lord and God Jesus Christ went through in His last two days of His earthly life – Passions. A piece of exquisite yet passing beauty, it comes from a bell-shaped bud to open and live for only one day and then succumb to its fading death in the same bell-shaped form. The tropical vine it grows on is lavished with multiple flowers and draws one’s attention immediately by the flower’s perfect shape and hidden mystery. The colors vary from deep purple (the color of Orthodox priests’ vestments during the Great Lent) to scarlet red, yet the numerical constituents remain the same: 10 petals (5 petals and 5 sepals identical in shape and color), 1 column, 72 corona filaments, 5 anthers, 3 stigmas. Additionally, the vine’s leaves are shaped like a spear used to pierce Christ’s side. Some even find representation to Judas’ 30 pieces of silver (dark round spots on the underside of some species). Ominous may it seem to some or not, this flower graciously and quietly speaks of the most inspiring, life-changing and soul-bending story ever told to mankind. The Orthodox faithful in Columbus area will have abundant services during the remaining days of Holy and Great Week of Christ’s Passion (up until Holy and Great Friday). We declare in words of solemnity that His priesthood and His Church have been restored upon the earth—“built upon the foundation of … apostles and prophets, Jesus Christ himself being the chief corner stone” (Eph. 2:20). We bear testimony, as His duly ordained Apostles—that Jesus is the Living Christ, the immortal Son of God. He is the great King Immanuel, who stands today on the right hand of His Father. He is the light, the life, and the hope of the world. His way is the path that leads to happiness in this life and eternal life in the world to come. God be thanked for the matchless gift of His divine Son. He died, a broken law to satisfy . . . The answer to those questions is an unequivocal and eternal no! With prophets ancient and modern, I testify that “all things have been done in the wisdom of him who knoweth all things.”4 Thus, from the moment those first parents stepped out of the Garden of Eden, the God and Father of us all, anticipating Adam and Eve’s decision, dispatched the very angels of heaven to declare to them—and down through time to us—that this entire sequence was designed for our eternal happiness. It was part of His divine plan, which provided for a Savior, the very Son of God Himself—another “Adam,” the Apostle Paul would call Him5—who would come in the meridian of time to atone for the first Adam’s transgression. That Atonement would achieve complete victory over physical death, unconditionally granting resurrection to every person who has been born or ever will be born into this world. Mercifully it would also provide forgiveness for the personal sins of all, from Adam to the end of the world, conditioned upon repentance and obedience to divine commandments. Correspondence in the possession of Jeffrey R. Holland. “I Stand All Amazed,” Hymns, 193. “How Great the Wisdom and the Love,” Hymns, 195.